Bernard Malfroy-Camine, Ph.D., is President and CEO of MindSet Rx., which is a continuation of Eukarion, a Biotech company he had founded in 1991 and led since inception. He also serves as Executive VP, Business Development at Voisin Consulting (www.voisinconsulting.com) on a part-time basis. Formerly he was Director of Development at Alkermes, and scientist at Genentech. He started his scientific career in France as a researcher at CNRS. He has over 80 scientific publications and about 20 patents. Over the years he has discovered or was involved in the discovery of one approved pharmaceutical drug (Tiorphan; www.bioprojet.com), a new proprietary active ingredient for cosmetics (EUK-134; www.unipex.com), and several compounds that went into various stages of clinical trials. While he has been living in the United States with his wife and 5 children for the past 28+ years, he is getting more and more involved in the Biotechnology industry in France, his country of origin. He is Vice President of the Board of Supervisors of Genomic Vision (www.genomicvision.com), a spin-off from Pasteur Institute, Paris, Chairman of the Board of Sensorion (www.sensorion-pharma.com), a spin-off from Inserm, Montpellier, Member of the Board of the US-based company EyeGate Pharma (www.eyegatepharma.com) and Business Development Advisor to the Mulhouse based company Rhenovia Pharma (www.rhenovia.com). Since 2002 he has served as Foreign Trade Advisor to the French government (www.ccefboston.org). Bernard graduated from Ecole Polytechnique, Paris, in 1976, and earned a Ph.D. in Neurobiology from University Paris VI in 1982. In 2002 he was made Chevalier dans L'Ordre National du Merite for his contributions to biotechnology in France and in the USA. Michel Baudry, Ph.D., is currently Professor of Biomedical Sciences and Dean of the Graduate College of Biomedical Sciences at Western University of Health Sciences in Pomona, CA. His previous position was Professor of Biological Sciences, Neurology and Biomedical Engineering in the College of Letters, Arts and Sciences at the University of Southern California in Los Angeles, CA. After graduating from the prestigious Ecole Polytechnique in Paris (France) in 1971, Baudry obtained a Ph.D. in Biochemistry at University of Paris VII in 1977 under the direction of Prof. J.C. Schwartz and Prof. J.P. Changeux, two of the most distinguished French neurobiologists. In 1978 he moved to the United States of America for a postdoctoral period with Prof. Gary Lynch at the University of California at Irvine. He remained at UCI as an Assistant and then an Associate Professor until 1989, before moving to USC in 1989. In collaboration with Prof. Lynch, Baudry developed a biochemical theory for Learning and Memory that is still one of the most widely accepted theories in the field. Baudry’s research is directed at understanding the molecular mechanisms of learning and memory as well as those involved in neurodegenerative processes underlying numerous human brain diseases. 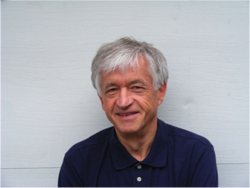 Baudry is a world-known neuroscientist and has published over 350 manuscripts in peer-reviewed journals. He is one of the 100 most cited neuroscientists, according to the ISI database. Baudry has also been involved in several biopharmaceutical start-up companies. In 1986 he was one of the co-founders of Synaptics, Inc, the Human Interface company, specializing in touchscreen technology. In 1991, he co-founded Eukarion, Inc, with Bernard Malfroy, and more recently participated in the transformation of Eukarion into MindSet, Rx. In 2007, he also co-founded Rhenovia Pharma, a drug discovery & development company located in Mulhouse, France, and using unique biosimulation platforms for discovering new treatments for CNS and PNS diseases.